In 1959, the changes were minor. The grille was once again changed to a bar formation (as compared to the grid formation from the 1958 Ford Trucks). The hood had a raised portion in the center for added support (this was done mid-year, so not all 59 trucks have this). Rectangular turn signals replaced the circular turn signals of the 1957 & 1958 trucks. A groove was inserted into the front bumper so a license plate could be attached. Hood emblems changed, the front of the hood now had the lettering F O R D in place of the emblem on the front of the hood on the 1957-1958 models. A dome light was now standard equipment. 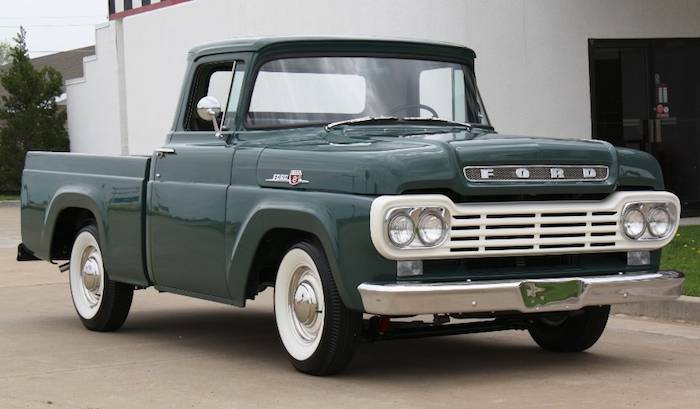 The biggest change for 1959 was that a factory four-wheel-drive option was introduced (previous to that, 4x4 was available through an aftermarket conversion), we're not positive but this may have been limited to F-250 models. '59 Ford trucks also saw a larger V8 (292 c.i., 186 horsepower) engine and two-tone interior trim. All photos of the green '59 F-100 shown here are used with permission from HappyCarz.